November 2018 is Ozarks Food Harvest month at Community Blood Center of the Ozarks! 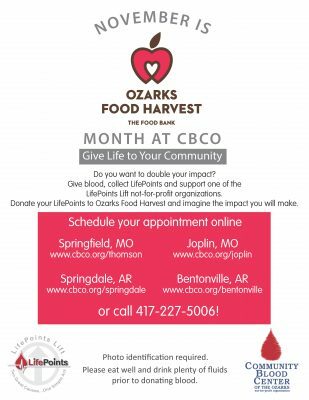 It’s a great way to help two non-profits at the same time — CBCO with your lifesaving gift of blood and Ozarks Food Harvest with your LifePoints which allows the organization to work toward its mission of Transforming Hunger into Hope. You’ll receive LifePoints for your donations all year round, and you can give your LifePoints to one of our agency partners at any time. Not just in November. But November is our time to share information about Ozarks Food Harvest. Ozarks Food Harvest is the Feeding America food bank for southwest Missouri, serving 270 hunger-relief organizations across 28 Ozarks counties. The food bank reaches nearly 30,000 individuals weekly and distributes 17 million meals annually. In 2018, OFH received its sixth consecutive Four-Star Charity Navigator rating. The food bank has been named the Small Business of the Year by the Springfield Area Chamber of Commerce and the Nonprofit of the Year by Springfield Business Journal. Its facility, the O’Reilly Center for Hunger Relief, has also received “superior” AIB International food safety certifications. Founded in 1983, Ozarks Food Harvest has a stated mission of Transforming Hunger into Hope. The simple statement serves as a visionary and meaningful summary of Ozarks Food Harvest’s goals, while expressing exactly what it is The food bank does. Ozarks Food Harvest provides food distribution and services to 270 Ozarks nonprofits through programs such as the Weekend Backpack Program, Mobile Food Pantry, After-School & Summer Food programs, Senior Food Program, and more. To learn more about Ozarks Food Harvest, click HERE. Founded in 1995, CBCO has grown to serve 39 counties in three states and is the sole supplier of blood and blood products to 41 hospitals in southwest Missouri, northwest Arkansas, and southeast Kansas (as of 11/1/18).